How Email Questionnaire works - CompressWeb -- Enhance your web experience. This is achieved using the Compressweb Formmail gateway. When a questionnaire is sent out, a HTML document is sent either as a MIME encoded email or as an mhtml attachment. After the user clicks on the submit button of the questionnaire, the email client/web browser will send the result using either the POST/GET HTTP protocol method. This information passes through Compressweb Formmail gateway. After the gateway composes a new email message, it is then sent back to the questionnaire sender. How does EQ get questionnaire replies from my email account? EQ needs to wait for the email clients to retrieve emails. 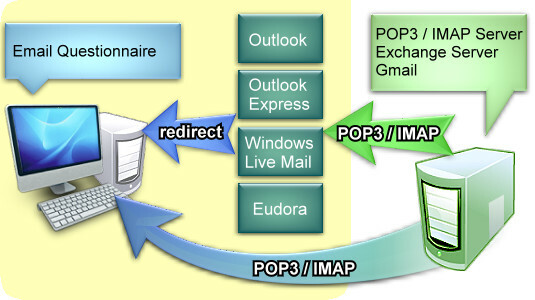 Generally, a user will periodically poll the pop3 server for new emails. After a new email has arrived, EQ will then check if the new email message belongs to EQ. For Outlook/Eudora, EQ uses a plug-in to detect whether a new questionnaire reply has arrived, and redirect if necessary. For Outlook Express, EQ polls every 30 seconds to check if any new questionnaire replies have arrived specifically for EQ. If new replies are detected it will be retrieved. EQ polls every 60 seconds to check if any new questionnaire replies have arrived. It will be deleted from the mail server after being read by EQ.